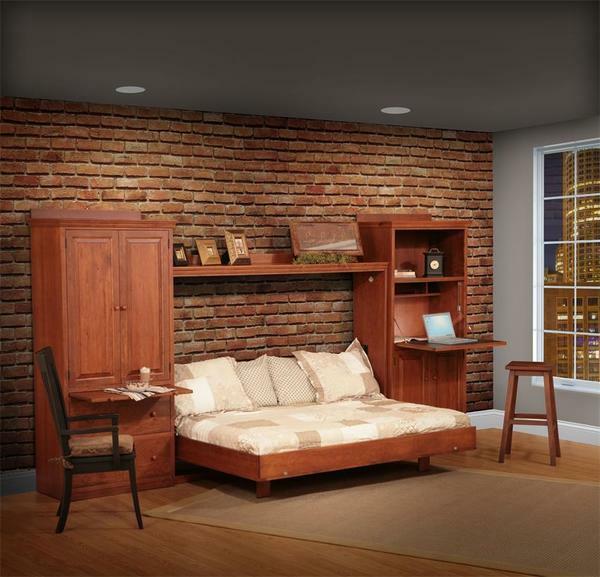 Our solid wood Comfort Wood Horizontal Wall Bed makes for an easy morning when your don't have a bed to make up! Just simply close your bed and your room will look clean! This murphy bed is a new and improved design and proudly made in the USA! This Amish handcrafted wall bed comes with a state of the art piston lift mechanism that uses only a few moving parts. This system is preferred by leading hotels, apartments and homes. The murphy bed piston lift system is counter balanced and designed for daily use. There is a locking mechanism that prevents the bed from being lowered incorrectly and locks the bed inside of the wood frame when it is not being used. There is an end lift or side lift available. You can use any standard innerspring mattress with this wall bed. The mattress or side cabinets are not included in the cost of this horizontal wall bed. The mechanisms are completely contained within the cabinet and require no adjustments. Our Comfort Wood Horizontal or Side Lift Wall Bed is available by itself, but this complete set includes both spectacular side units! Ideal for a guest room or in law suite, these beautifully designed side units offer clothe-storage space, desk and writing space, and even a slide-out eating or reading counter! This Amish murphy wall bed ships unassembled and can be easily moved. The unit is made to be mounted to the wall so it will not leave damage to your floor or holes in your carpet. Since the bed is wall mounted you will need to have several holes in your wall for the wall mounting mechanisms. Note our standard option on this bed is with with veneer sides to avoid splitting, warping and related concerns that similar hardwood sides are prone to encounter. CAUTION: This bed contains stored mechanical energy. Accordingly, anchor hardware must be securely fastened to the wall. Failure to do so may result in severe injury or death. *Please note - bed sides come standard with same species wood veneer and an internal ply, which eliminates a possible splitting or warping that can occasionally occur in high stress situations with the wall bed mechanisms. Slide Max Weight of 100 lbs. Unit ships in four pieces and can be broken down further to fit through doorways and openings. Once in the desired location, your wall bed will need to be secured to the wall with three bolts (included with your order) along with instructions.